When 19 year-old Ben Burns (Lucas Hedges) unexpectedly returns home to his family's suburban home on Christmas Eve morning, his mother, Holly (Julia Roberts), is relieved and welcoming but wary of her son staying clean. Click Here To Subscribe To Our Weekly Newsletter! 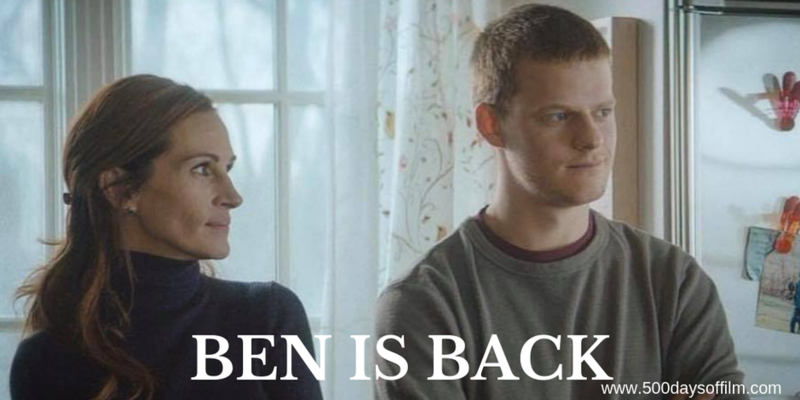 Ben Is Back is a gripping if contrived and rather stagey movie about the desperation of drug addiction. Covering similar ground to Felix Van Groeningen’s recent film Beautiful Boy, director Peter Hedges’s looks at the impact of addiction on a family - with a particular focus on Ben’s mother, Holly. While there is nothing new here that we haven’t seen countless times before - the promises, the lies, the paranoia, the betrayal, the heartbreak - Ben Is Back keeps our attention because of its two powerful central performances. Lucas Hedges may not have as much to work with as Beautiful Boy’s Timothée Chalamet, but he is never less than compelling. Hedges certainly is an extremely impressive actor. However, it is Julia Roberts that gives Ben Is Back its power and sense of gravitas. Hers is an incredible performance - running the gamut of emotions. It is largely thanks to Roberts that Ben Is Back works - her moving portrayal of a mother who is absolutely desperate to save her son carries us through the moments in which the film’s story fails to convince. Have you seen Ben Is Back? My kind of film . Cannot wait too see them all .